Duncan and Celia pose under an oak tree in Elings Park. LOCATION: Duncan and I got married at Singleton Pavilion at Elings Park, in a ceremony under the trees. Our good friend and KJEE deejay Bernie Baggs was our officiant. We wrote our own ceremony, including our vows, and had a blueberry-tree-planting ceremony as the unity symbolism. Keeping to the wedding theme of an early-1900s garden party, the groomsmen wore vests and neckwear. 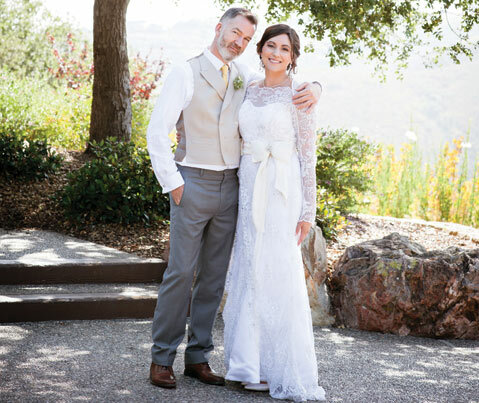 THEME: The theme of our wedding was early-1900s garden party: Downton Abbey meets Mark Twain. 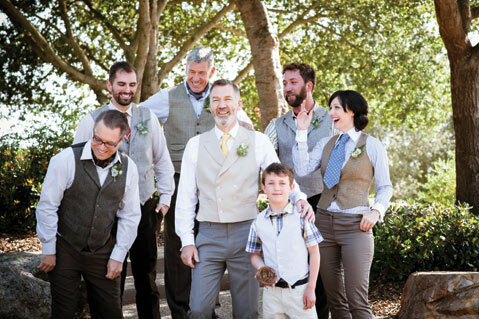 The groomsmen (and one groomswoman) wore vests with cravats, bow ties, etc. The bridesmaids each wore a different dress by vintage-inspired fashion designer Nataya (natayadresses.com). FLOWERS: The flowers were a combination of seasonal, local flowers that included peonies. Our florist was Tracey Morris from Ella & Louie (ellaandlouie.com). MUSIC: KCSB deejay Darla Bea Smith was in charge of the tunes. 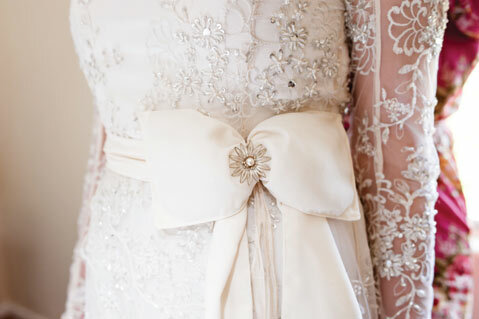 A detail of Celia’s wedding dress. CATERER: Lazy Acres provided the food. It made sense for us to use them since it is our favorite market in town, and we wanted the emphasis of the food to be local and organic. They also made our amazing strawberry shortcake, which wasn’t a typical wedding cake but was super delicious. People still talk about that cake! DRINKS: Our bartender was S.B. artist David Diamant (davidjdiamant.com). The signature cocktails were “The Celia” (a lavender vodka lemonade) and “The Duncan” (basically a Manhattan). We also had beer and wine. DANCE: Our first dance was to “Little Trip to Heaven” by Tom Waits. 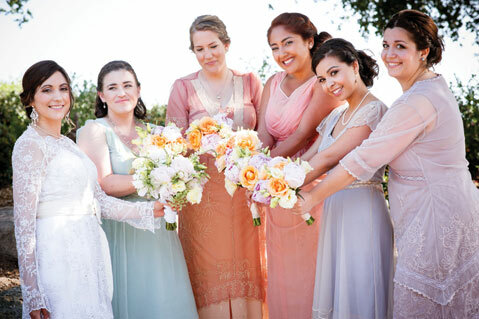 The bridesmaids (bottom) donned vintage-inspired frocks. SEATING: We had banquet-style seating that was arranged to create a square with the dance floor in the middle. As Duncan is from England, our tables were named after pubs that we had been to, or that Duncan had worked at, loved as a young man, etc. (e.g., The Queen’s Head, The King’s Arms, The Adam and Eve). The table names were put into brass frames that I spent a year scouring thrift stores and antique shops to find. HONEYMOON: We spent our honeymoon sailing the Adriatic Sea off of the coast of Croatia. Duncan was the captain, and I was the crew: an exciting end to a wonderful weekend!